The fresh yeast market report analyzes the opportunities in the global market analyzing the data on a historical basis, estimated data for 2018, and forecasted data till the year 2026. Market analysis includes data in terms of both value (US$) and volume (MT) basis. Market outlook of the fresh yeast report covers food and beverage industry overview, bakery market outlook, alcoholic beverages market outlook, macroeconomic outlook, forecasted factors, the market dynamic section includes key drivers, trends, and restraints prohibiting the growth of fresh yeast market, value chain analysis, and others. Competitive landscape of multinational players operating in the business of fresh yeast market and market attractiveness analysis by nature, form, end use, distribution channel, and region are some of the key insights covered in the report. The research reports asses the market share of fresh yeast market on a global perspective by nature, form, end-use, distribution channel, and regional segment. The regional segment includes fresh yeast market of North America, Latin America, Europe, Asia-Pacific, and the Middle East and Africa. The report provides a market outlook for historical data for 2013 – 2017, and forecasted data for 2018 – 2026. This study includes in-depth analysis of global fresh yeast market including new recent developments, product offerings by key yeast manufacturers in the global fresh yeast market, opportunity assessment, and discuss the key drivers and trends contributing towards the growth of fresh yeast market globally. The global fresh yeast report begins with estimating the market in the base year in terms of value and volume consumption. To arrive at the volume consumption of fresh yeast, Persistence Market Research (PMR) estimated volume data on consumption of fresh yeast for several countries are assessed by understanding the demand and supply of fresh yeast. It includes production, growth, volume and value sales, transition, pricing, consumption of fresh yeast in the bakery, confectionery, processed food, soups, sauces, dairy products, dietary supplements, meat and poultry products, alcoholic and non-alcoholic beverages, animal food and many other factors were scrutinized. PMR then determined the volume consumption of fresh yeast across various regions including North America, Latin America, Europe, Asia Pacific, and the Middle East and Africa. To forecast and analyze the data, an internal proprietary model is used by analyzing different macro-economic, industry-based demand driving factors impacting the market and its forecast trends. Factors include the growth of the food and beverage industry using fresh yeast and its sub-industry verticals, the growth of pet food and feed industry, consumption pattern, per capita expenditure, and others. Further, by identifying and allocating a weighted score to macroeconomic and forecast factors that influence the demand for fresh yeast market is assessed. Factors such as the production of fresh yeast, consumption pattern among end-user industry such as food and beverage industry and animal food and feed industry and others have been taken into consideration to arrive at the volume consumption of fresh yeast in respective countries. While analyzing the market, valid and authorized secondary data sources were considered and also primary interviews were conducted in order to arrive reliable and accurate data about fresh yeast market. To analyze the pricing of fresh yeast, weighted average selling price method for fresh yeast was considered to estimate the market size for fresh yeast. These prices were captured in their respective countries and then converted into USD to offer forecasts in one consistent currency standard. Given the characteristics of the market, PMR triangulated the data based on the demand side, supply side, and market dynamics of the global fresh yeast market. To develop the global fresh yeast market forecast, PMR analyzed various factors to understand their respective impact on the target market. However, quantifying the market across the segments such as by nature, form, end use, and distribution channel segment, it is more a matter of quantifying expectations and analyzing the opportunities rather than rationalizing them after the forecast has been completed. It is imperative to note that in an ever-fluctuating economy, PMR not only provides forecasts in terms of CAGR but also analyze on the basis of key parameters, such as year-on-year (Y-o-Y) growth, to understand predictability of the market and identify the right opportunities. Another key feature of this report is the market attractive index of each segment of the global fresh yeast market and the corresponding revenue forecast in terms of absolute dollar opportunity. To understand key segments in terms of their growth and performance in the global fresh yeast market, Persistence Market Research has presented a market attractiveness index. The resulting index should help providers identify existing market opportunities in the global fresh yeast market on the basis of market size, market share, and incremental opportunity. Revenue forecast in terms of absolute dollar opportunity is usually overlooked while forecasting the market. However, absolute dollar opportunity is critical in assessing the level of opportunity that a provider can look to achieve, as well as to identify potential resources from a sales perspective in the global fresh yeast market. In the final section of the report on the global fresh yeast market, the competitive landscape is included to provide a dashboard view of global fresh yeast manufacturers. This section also includes the list of key distributors and suppliers for the food and beverage industry. During the course of research, many secondary and primary sources were considered. List of secondary sources includes paid databases, annual reports, investor presentations, publications, newsletters, blogs, reports published by industry associations, and others. Detailed company profiles of the fresh yeast manufacturers are included in the scope of the study to evaluate their key strategies, key developments in the fresh yeast market space, and regional presence of fresh yeast manufacturers. Some of the key players analyzed are Kerry Group PLC, Angel Yeast Co., Ltd., Oriental Yeast Co., ltd., Leiber GmbH, Renaissance BioScience Corp., Lallemand Inc., Lallemand Inc., DCL Yeast Ltd., Imperial Yeast, Lesaffre Group, Chr. Hansen Holding A/S, Laffort SA, UNIFERM GmbH & Co. KG, AB Mauri Ltd., Koninklijke DSM N.V., and others. Yeast is single-celled fungi which are eukaryotic, classified as a member of the fungus kingdom. Yeast, also known as Saccharomyces Cerevisiae, is famously being used as a fermenting agent or leavening agent. Fresh yeasts are widely used in food, beverage, and animal feed and pet food industry. The research demonstrates the consumption and opportunities in the fresh yeasts market at regional and country level market scenario. Research report includes key insights, in-depth market analysis, market dynamics, value and volume forecast of fresh yeasts, and opportunities for fresh yeasts manufacturers operating at the regional and country level market. Yeast is considered a low shelf life product, which has large-scale application in the food and beverage industry. The rise in consumption of bakery and alcoholic beverages has been driving the demand for fresh yeast products in the global market. Owing to a rise in the demand for the product, most of the major shareholding manufacturers are now strategizing on increasing their production capacities and strengthening their distribution channel in the fresh yeasts market. Alcoholic beverages are widely consumed around the world through its demand is settled in North America and Western European countries, but its demand is increasing in Asia Pacific countries. This increased rate of consumption of alcohol has witnessed significant growth, both, in developing countries. Among the alcoholic beverages, beer, whiskey, and wine are being consumed at a higher rate compared to other beverages. The industrialization of production, and globalization of marketing, and promotion of alcohol have been driving the global sales of alcoholic beverages. Fresh yeast is one of the main ingredients that is being used in the production of most alcoholic beverages such as beer, wine, whiskey, etc. There are two main types of yeast that are being used - ale yeast and lager yeast. Fresh yeast provides the right proportion of texture and flavor to beer during its production. Resultant, a rise in the demand and consumption of such alcoholic beverages has been driving the demand for the yeast market on a global level. Fermented foods contain microorganisms such as bacteria and yeast that use the nutrients in the food as an energy source, which results in the transformation of food which contains organic acids and other compounds having several critical health benefits. A rise in the awareness of the health benefits associated with the consumption of fermented food is one of the marquee factors driving the demand for the product. Fresh yeast is one of the ingredients used on a large scale in the production of such fermented food and beverage products. Over the forecast period, the fermented food & beverage market is expected to grow at a high growth rate in terms of value sales. Food products such as yogurt, probiotic foods, and some traditional Asian foods have been fast gaining traction among the target consumers around the world, especially in North America and the Asia Pacific. As a result, the rise in the demand for fermented food products has been driving the demand for fresh yeast in the global market. In terms of value, the global fresh yeast market is expected to exhibit an incremental opportunity of US$ 1.4 Bn by 2026 end over 2018. By form, the organic fresh yeast segment is projected to grow at high CAGR owing to increasing consumption of organic food and beverages in U.S., U.K, France, Germany, Italy, and other Western European countries. On the other side, the demand for fresh yeast is increasing at a higher pace in the Asia Pacific and Latin American countries owing to increasing demand for food and alcoholic beverage industry in these regions. On the basis of form segment that includes powder and liquid fresh yeasts, the demand for liquid fresh yeasts is projected to expand at a volume CAGR of 5.3% in the global fresh yeasts market. Europe has been considered as the dominant region for bakery products. The region has witnessed a rise in the consumption of bread and cakes over the past couple of years. In addition, fresh yeasts also uphold the majority of market share in the North America region. Currently, the demand for fresh yeast in these regions is of natural fresh yeasts ingredients. The factors pushing the demand for fresh yeast in the developed regions is of minimally processed, healthy, natural, organic, fresh yeast as it brings natural taste and also suitable for the consumer seeking for vegetarian food products. In these regions, consumers are willing to pay more for food and beverage products that claim that they are natural, clean, minimally processed and formulated to offer quality and natural taste. Furthermore, the influence of fresh yeast in the Asia Pacific market is increasing in the bakery, savory, snacks, and other food products owing to the prevalence of westernization food culture. Fresh yeast has a high demand in the alcoholic beverage industry of Asia Pacific and Latin American market. Fresh yeast is one of the most common forms of fresh yeast consumed in the global yeast market and especially in bakery products. On the basis of a regional segment, fresh yeast market is segmented on the basis of North America, Latin America, Europe, Asia Pacific, and the Middle East and Africa. At a regional level, North America and European market hold more than 70% market value share in the global fresh yeast market. On the other side, the demand for fresh yeast is increasing at a higher growth rate in the Asia Pacific and Latin America countries including China, India, Brazil, and other ASEAN countries. 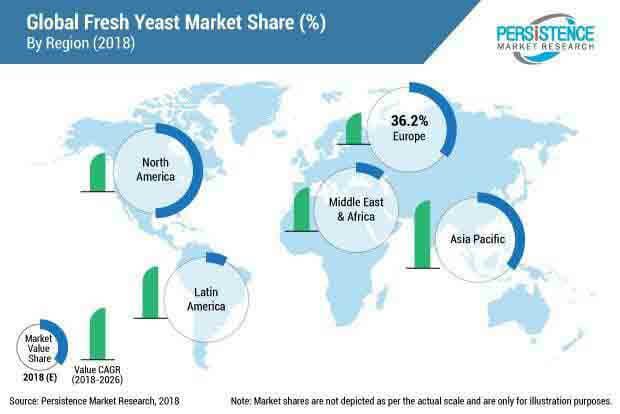 At the regional level, Asia Pacific is expected to be the fastest growing market in terms of value and volume in the global fresh yeast market. Though the Middle East and Africa accounts minority of share in the global market; the demand for fresh yeast is increasing in GCC and South Africa.